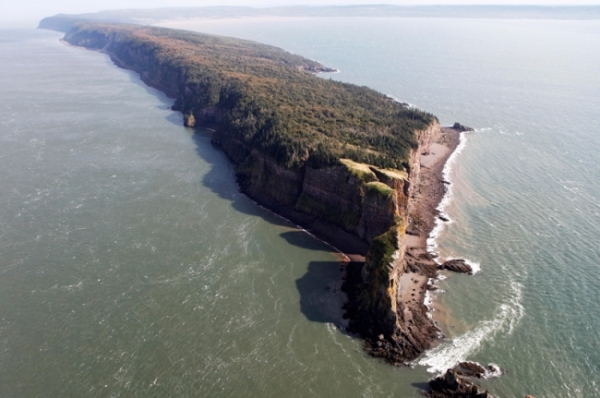 A large natural environment park popular with hikers, is considered to be a provincially significant coastal landmark overlooking the Bay of Fundy. The site offers wildlife and tidal viewing opportunities. Distance: About 6 km (4 mi.) one way, 12 km (8 mi.) return. Enjoy a moderately challenging back country hike in this 430-hectare park, which protects important natural and cultural values. The trail opens out to a look-off 60 metres (200 feet) above the rugged coast of the Bay of Fundy. Open year round from dawn until dusk daily. About 6 km (4 mi.) one way, 12 km (8 mi.) return. Return travel time: 2.5 to 5 hours. • Cliffs are actively eroding and unstable—keep well back. • Incoming tides are fast, strong, and unpredictable—shoreline exploration NOT recommended. • Wear sturdy footwear and appropriate clothing—weather may change quickly. • Take plenty of water and apply sun protection. • Plan to return to the trail head before dusk. • Tell someone that you’re here and when you expect to return home. Please respect this natural area by: Packing out all garbage, and keeping pets leashed at all times. Camping, campfires and hunting are not permitted. Note the toilet locations (marked on the trailhead sign) and plan accordingly.